Found this old Bus mouse at the recycling center. I cant really find any information about it. can find a similar ones but not this exact model. would like to know if there is a easy way to get it to work via ps2? i think the box is missing a converter but cant find what kind of converter this should be. The mouse uses a bus connector. In order for it to work it would have connected to a special add-in ISA card to talk to the computer. As for converting it to ps/2, I don't think it's possible. With some code you could probably get it running with a teensy or Arduino micro in mouse emulation mode over USB. At least active adaptors to RS-232 exist. Early versions of the "Dove bar" 'Microsoft Mouse had an "InPort" plug and were sold with such an adaptor. 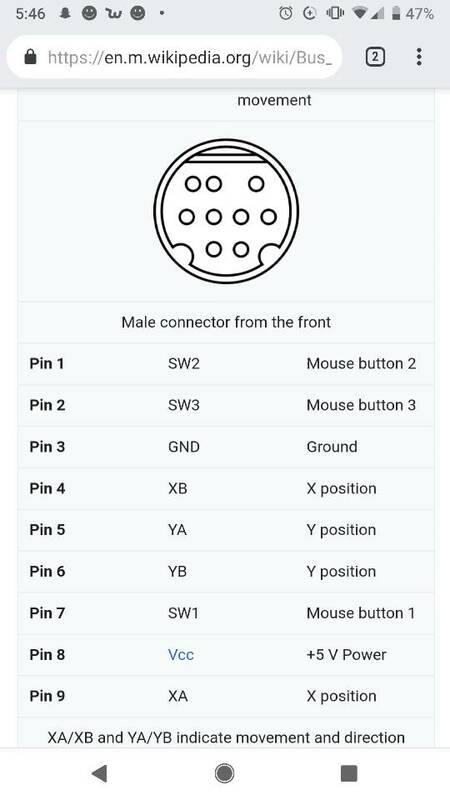 From the pin-out, I suspect that they would work similar to how mice for Amiga and Atari ST interfaced with the computer. These also had two lines for the X-axis and two lines for the Y-axis, and one line for each button. Each line shorted to ground when active. Each axis over its pair of wires produced a "quadrature code" ((also called "2-bit Gray code" or "two pulse trains 90° out of phase"). Each axis produced a sequence of 00, 01, 11, 10 or the reverse sequence depending on whether it rolls forwards or backwards. Grey codes have the property that only one bit changes in each step. The Amiga and Atari had a pull-up resistor on each line on the host-side. Some partially-compatible devices that used the same type of port had the pull-up resistors in the device instead - do check! cnrmsn wrote: ↑ As for converting it to ps/2, I don't think it's possible. With some code you could probably get it running with a teensy or Arduino micro in mouse emulation mode over USB. Going to look in to buying myself a teensy for Christmas. Hand-wiring a keyboard also looks like fun with one of those. Not a lot of coding experience so expecting it to be quite a challenge to get the mouse working that way. Findecanor wrote: ↑ At least active adaptors to RS-232 exist. Early versions of the "Dove bar" 'Microsoft Mouse had an "InPort" plug and were sold with such an adaptor. Here is a picture of the inside of the box. Doesn't look like there was an active adapter inside because of the lack of space. going to check next week if they have the missing part or anything that resembles that adapter. Probably a long shot but who knows. I have been curious too, so I have looked around a bit. Difficult to find working search terms though. I have seen several claims that Bus mice would be "the same" as Amiga/Atari mice with a different pinout, but no actual substance backing up those claims. Several USB or PS/2 mouse to Amiga and Atari converters exist, but the other way around is almost nonexistent. The 2600-daptor D9 is a converter that supports many different 9-pin devices to USB, including Amiga and Atari mice. * Reddit post about reading a 1983 Microsoft "Green-eyed" "bus mouse" with Arduino. Comes with source code snippet. However, that one mouse is special in that it uses a 9-pin dsub, not the mini-DIN port. * Another post where a guy hooked up a "PC bus mouse" to an Amiga just by wiring, but he did not mention the brand and model. It was purely electromechanical, not optomechanical, so I wouldn't be sure about signal levels. * Some old PC's from Commodore did come with an Amiga-compatible mouse port on the motherboard ... which showed up in DOS as a bus mouse. Findecanor wrote: ↑ I have been curious too, so I have looked around a bit. Difficult to find working search terms though. Very hard to find anything on this mouse with not much info on the mouse and the packaging. That 2600-daptor D9 converter looks promising but that will need a change in pinout. Where did you find the claims about the Amiga/Atari and Bus mouse being the same but with different pinout? Here is a picture of the inside of the Bus mouse. Very little experience with this but is it a safe bet that the wire colors correspond to the atari/amiga wire colors? Because the pinout for those is searchable. I don't remember which forums I found that info on -- it's hearsay, useful only as a lead. You would also need to see the circuit side to trace the lines. Then google up a circuit diagram of an Amiga mouse's innards and compare. The Amiga seems to be quite well documented. I googled that the chip inside the Bus mouse, the MN4584B has six ("hex") Schmitt triggers, each with its pair of pins on either side. There are other similar chips that do the same thing so the chip might not have to match exactly. I guess that the resistor values don't need to match exactly either. I'm a programmer, not an electronics-engineer, but I would never trust wire colours. Not even between devices of the same type. If you have a very early copy of a PC repair guide that might help you. The only bus mice I have ever seen required a separate ISA card to function. The pinouts for serial and P/S2 are similar. There are adapters for those. Bus mice were not used for very long. I have never seen an adapter for one. It uses an Arduino Pro Micro, but with the Arduino IDE and libraries. Findecanor wrote: ↑ I'm a programmer, not an electronics-engineer, but I would never trust wire colours. Not even between devices of the same type. Sound advice. Will trace the lines to make sure it connects correctly. Pro micro is already orderd from china. Will check in once that arrives in the mail. Will probably take a few weeks but the damn things are 8 times the price if i buy them locally. Circuit diagram of an Amiga mouse was pretty easy to find. And will read up on that adapter project thread. Thanks again for all the information Findecanor. Priapoz wrote: ↑ Found this old Bus mouse at the recycling center. I cant really find any information about it. can find a similar ones but not this exact model. would like to know if there is a easy way to get it to work via ps2? Yes, sure. Easiest way, technically, is to find MS adapter: instant compatibility with PS/2 (and serial) port. But if you can use soldering iron, you can just find an old PS/2 ball mouse and use it as a converter - either in the form of stand-alone "dongle", or by putting its controller & PS/2 cable inside your mouse. Archie wrote: ↑ But if you can use soldering iron, you can just find an old PS/2 ball mouse and use it as a converter - either in the form of stand-alone "dongle", or by putting its controller & PS/2 cable inside your mouse. Hey, that first idea is pretty clever! A transplant of its guts would require that the parts have about the same shape... which is not always likely. But you might be lucky. Mods of old mice to USB or from ball to optical have been made that way. No, I've just uploaded this image to show "what's BusMouse to PS/2 adapter looks like". I don't use mice at all, but modded some of my trackballs using described method. I'm sorry, I had forgotten to mention this adapter when I stumbled upon it a couple of weeks ago: Retronic USB Joystick adapter. It uses a ATmega328P microcontroller, and schematics and firmware are free. You would load a different firmware on it for each type of device that you want to adapt, and there are firmware images and source code for several types of mice, including 3-button Amiga mouse.